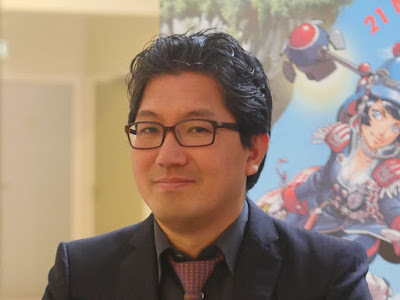 Yuji Naka, born 1965. Video game programmer, designer, and producer. He joined SEGA in 1983 and later headed Sonic Team as lead programmer of the original Sonic the Hedgehog series of games on the Sega Genesis. He left SEGA in 2006 to found a game company, Prope. 217 (member of dance unit Cojirase The Trip). Naka: When I was doing my long stint as a programmer – it was only for 13 years though – I tried to do new things with the technology. At the time I was using SEGA hardware, so I tried to do the maximum I could with it. Otherwise we wouldn’t be able to beat Nintendo, you see. Kato: That’s like the “You're capable of more!” story that Master Hiro※ spoke about just now [excluded from this excerpt], with the demands you place on your team and the people around you. I think it's that kind of attitude. Naka: But it wasn’t so much that we did that because we were told to. We just enjoyed creating games so much. Kato: It’s fun, isn’t it. For us, we enjoy playing games and making books. Naka: I enjoyed sitting at a PC and pouring my energy into creation much more than being back at home. A pre-recorded message for Yuji Naka was played from Koji Aizawa, editor at Enterbrain, publisher of video games magazine Famitsu and others. Aizawa: You often write “YU2” as your alias, don’t you. Looking at it, since you’re Yuji, I wondered why the “2”. Apparently there's a theory that since there was already Yu Suzuki (of Virtua Fighter and Shenmue), it was to show you were the second and were aiming to outdoYu-san. I wondered if you had that kind of intention... What is the real meaning of YU2? 217: I’d like to know about that. Naka: You want to know about YU2, don’t you. Naka: As Aizawa-san mentioned, it’s because of Yu-san’s existence. Naka: Yu-san is Yu Suzuki, and he used to write “YU”. I’m Yuji so it’s also “YU”, but since Yu-san was using that “YUJI” was suggested so I decided to make it “2”. It didn’t mean I was trying to better Yu-san, but that I’m next after him, a sign of respect. You see, I added the “2” with the feeling that there’s no way I could surpass him; I would be after him, or beneath him. Yu Suzuki was truly a genius programmer back then, I mean he was amazing. Kato: He’s really amazing, isn’t he. Naka: He made games like Hang On, Space Harrier and Out Run. I love Space Harrier. Actually I got started by wanting to work on porting Space Harrier to the Mark III. Naka: The question was whether it was possible to recreate the Space Harrier screens on a Mark III. I tried all sorts of ways, but back then solely using sprites was insufficient to recreate it, so I did it by plotting the enemies on the scrolling surface. Just around the time I had managed to get that working and thinking it was looking promising, I got stumped on how to produce 3D effects on a 2D screen, and Yu-san taught me a lot about that aspect. 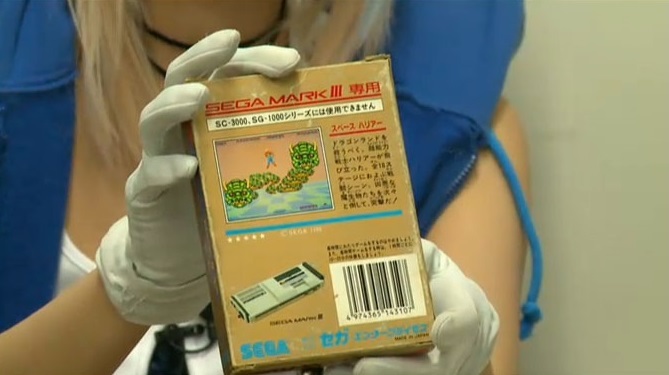 Also Space Harrier is designed such that as you play the game, it makes you feel skillful. That’s due to the clever program that Yu-san wrote. Even before you shoot, the enemy in front of the player is locked onto, automatically. It’s not shown in the game, but it’s locked onto. After you think you’ve aimed by yourself and pulled the trigger, your missile homes in and blows it up. It retains the fact that the player used to be in front of that enemy. He considered things like that. By doing that, the player feels that they’re good at the game, right? 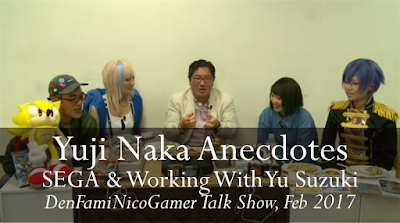 Naka: Yu-san put a lot of thought into that kind of thing, and told me “This is how you make a game more interesting”. He's amazing - a genius, wouldn't you agree? Naka: Take Out Run, too – like how to calculate driving on the course and out-of-course. I learned a lot through doing ports of Yu-san’s games like Space Harrier and Out Run. Kato: You had a lot of this kind of communication with him, didn’t you. Naka: Yes. I think he’s great, he’s someone I admire. 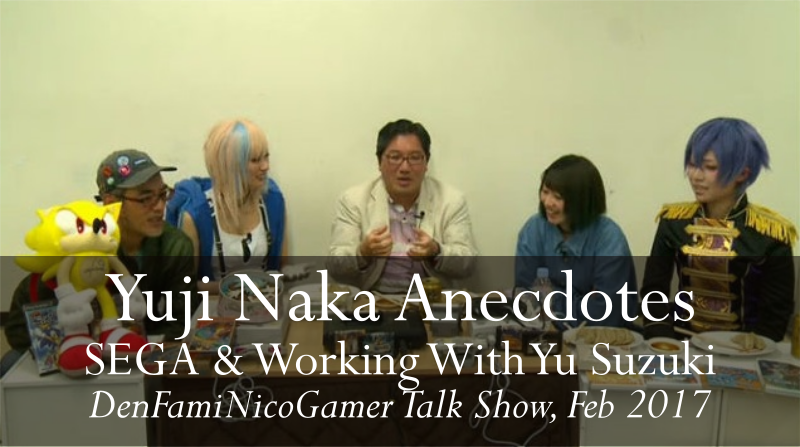 Naka: At one time, Yu-san was making Shenmue※, right? ※ Shemmue: released in 1999. A Japanese computer game series developed by Sega Enterprises (now Sega Games). An adventure game of the type which sets "flags" to track progress. It has realistic action through a huge amount of motion capture, fully-voiced down to the side-characters wandering through the city, with the townscape, characters and event scenes rendered in polygons by the device. Widely acclaimed for its world with its portrayal of weather and morning and dusk transitions, and the NPCs who follow daily schedules. 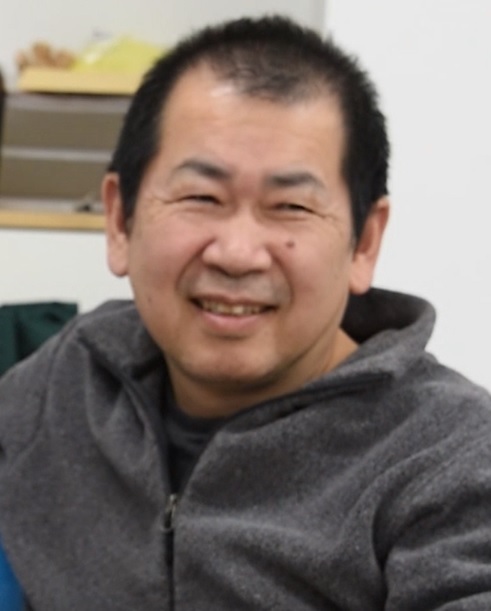 Naka: It’s great that he was making Shenmue. It also turned out to be a home console game; with just Sonic which I was working on, it was felt that SEGA wouldn’t be competitive. So Ijimajiri-san※ spoke with Yu-san and asked him to try his hand at making a console game, and what Yu-san started working on was Shenmue. ※Shoichiro Irimajiri: born 1940. A Japanese businessman from Kochi prefecture. Served as vice-president of Honda Motor Co., Ltd, president of SEGA (now Sega Games) and president of Asahi Tec Corporation. At the time, it was called Virtua Fighter RPG though. During that time, there weren't any Yu Suzuki-produced arcade games, right? What a great pity! I love Yu Suzuki’s arcade games. 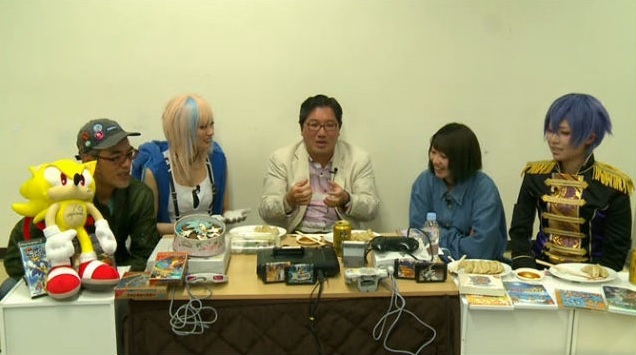 Kato: There’s a large number of arcade fans among SEGA fans. Naka: To be honest, I felt extremely bad for letting everyone down. It was as if I was lacking, from the perspective of the home console game division. 217: That’s a long time! Various games started coming out in the arcades like DDR [Dance Dance Revolution] and Konami’s music games. Since SEGA hadn’t made one, I found myself thinking “Why don’t we make one”. And on an impulse I thought up Samba de Amigo. Konomi: Wow, you did it! 217: It’s an absolute masterpiece! Naka: I gave an internal presentation, and although I was in the home console games division, I felt I had given a bit back by creating an arcade game. Kato: Great story! I had no idea such a tale was hiding. Naka: It’s just my account of it, though. Kato: What an awesome story. Leave your thoughts about the stories below. Thanks RedZeshinX. They are looking for a gauge of interest so for anyone interested, head over and put in a vote. By the way, I've heard very positive feedback about the quality of First4Figures's Lan Di statue (some photos were posted to this blog a little while back of the Exclusive edition: http://www.phantomriverstone.com/2016/11/lan-di-statue-photos-exclusive-edition.html ).